I found him at our desk, pieces of letter-sized paper stapled together splayed before him, writing. I went away. For about ten minutes. Then I came back. He was still writing. Then he wasn’t; holding his pen thougthfully before him, he pondered his next word. I came up behind him to take a photo and he didn’t even notice me. This was unusual. This boy never stops moving. He climbs, runs, jumps, leaving a wake of flipped chairs and furniture stripped of its pillows in his wake. He focuses on iPad games, but not much else. Reading, writing, drawing? Not his bag. 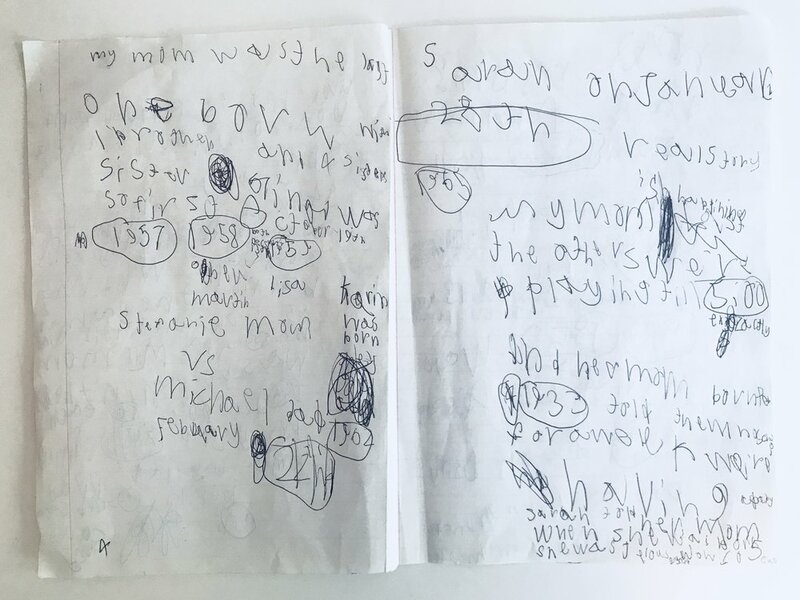 Apparently he’d seen his mom writing earlier and decided he wanted to be a writer, too. So there he was, at our desk, writing his book: I have a story by Colin Keith McWatters. It took over 45 minutes and ultimately clocked in at what is, for him, a whopping eight pages. It was full of details about his life and his family. Accurate details. Details we’d shared with him maybe once before, years ago — like the story about how his grandmother had induced labor by walking up and down stairs in the hospital. Details he’d apparently memorized and now decided to set to paper. And then there’s the tone, at times conversational and cheeky: “Do you know what a twin is? If you don’t and you really want to know and you don’t, I have a story buy it from me for $4.00 only.” He was writing for an audience. It’s been a tough year. Colin lost his grandfather and his grandmother. His mom is fighting cancer. His world is more tumultuous, so he’s seemed more scattered than usual. 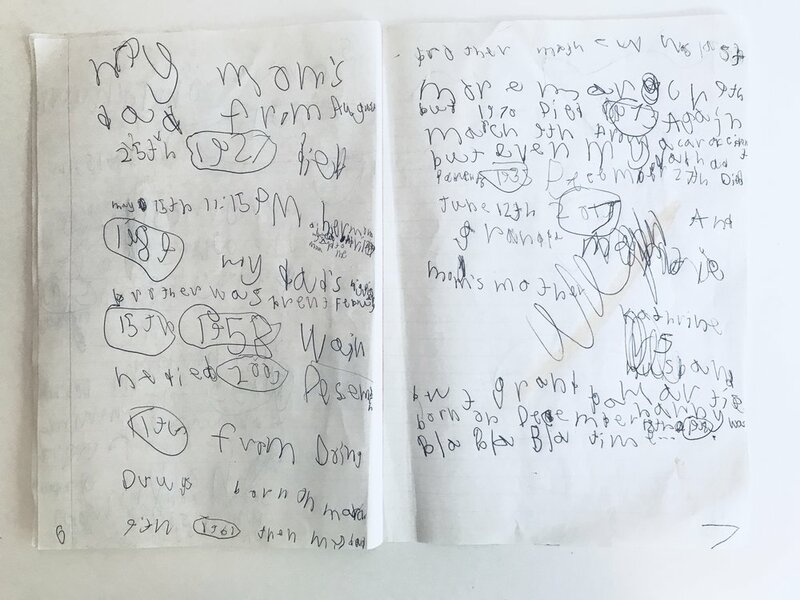 Tough for a kid who on his best days struggles mightily with inattentiveness and anxiety, not to mention the fine motor skills required to put pen to paper and formulate a story. Nonetheless, that’s precisely what he did for 45 minutes and eight pages. He wrote his story. I’m ashamed to admit I was surprised. He always surprises me. And even though I always say presume competence, I forget to do it myself. Of course he remembers everything we tell him, even the silliest story, even when it looks like he’s not paying attention. Of course he has stories inside him. Of course he can write a book. I love Colin’s book, but I think my favorite part is the image he drew of himself on the back cover, a tiny figure in a giant sea of white, capped by a single word: ME. Colin is nine. He’s autistic and amazing. He’s been riding them for years. Some were terrible, others were okay. One was great. This was a low point, but there were others. One short bus was just a beat-up yellow minivan blasting reggae music. Other buses had no a/c despite New York City’s notoriously hot and soggy summers. One had no heat: foggy clouds emanated from the driver’s mouth as he greeted Colin one January morning. One belched blue smoke and broke down regularly. It died its final death on a highway overpass during rush hour. The matron had to transfer the kids through traffic to a replacement bus when it arrived an hour later. Another short bus was perpetually late and the bus company’s only phone number was a single cell phone. Always busy. These stories aren’t unique to Colin’s buses. One friend waited two hours for his autistic son to arrive home. The driver wasn’t responding to calls from the bus company, and no one knew where they were or why they were late. No explanation was offered. Another parent’s non-verbal autistic child was dropped off at the wrong stop. Fortunately, a good samaritan saw the young boy wandering around, realized something was amiss, and went to work figuring out where the boy belonged. Had it not been for the kind stranger, all could have ended badly. But these short buses aren’t a joke, and they’re far more than a utility; for special needs parents, they’re a lifeline. And all we ask is that our kids make it from home to school and back without incident. We entrust our children to strangers who earn little more than minimum wage, and who have little if any training in special needs. And, in fairness, most of them do their jobs competently, if with little enthusiasm. Last week, however, we said goodbye to a very good bus. A great bus, in fact. It was clean and dent-free. It was quiet, with tinted windows to reduce heat and glare. Both the air conditioning and heat were effective, and it hummed like a sewing machine. Oh, and it was a hybrid. None of that made the bus great, however. Alex and Mariana, the driver and matron, made the bus great. Each morning Colin is greeted with big smiles. “Good morning, Colin!” they cheer. Mariana asks how his day is going so far. “Great!” he says as he bounds up the bus steps, backpack flopping behind him. Colin rides the bus for up to three hours every school day, and for the past several months, we’ve had the good fortune of knowing he’s riding with Alex and Mariana, two people who not only do their job ably, but who genuinely care about the children in their charge. Two people who won’t earn any extra money for being good and kind, but who do so anyway. Sadly, today was Colin’s last day on the best short bus he’s ever had. We’re grateful for the peace of mind you’ve given us, Alex and Mariana, and for the care and affection you’ve shown our son. Maybe, if the stars align, you’ll be picking Colin up again in the Fall. Either way, you’ll always hold a special place in our hearts. Colin, a young autistic boy, sits on a chair in an Ikea store, enjoying a relative moment of calm. I apologize for not knowing your last name; the conditions under which we met weren’t conducive to a more formal introduction. But please know that I’m extremely grateful for what you did for me and my family Sunday at the Brooklyn Ikea. You already know the beginning of the story, because you witnessed it: I was in the self-service area grabbing a cart when I let go of my son’s hand for an instant. Boom! He was off like a shot! I ditched the cart and was in hot pursuit. You saw me; I saw you. You said, “Is that your son?” I mindlessly said, “Yes,” and continued my chase. I honestly didn’t give you another thought: I had a visual bead on Colin and hoped to catch him before he got too far ahead of me. Plants, Housewares, Lighting — I was able to see him even though he was gaining ground. And then I lost him. His small frame and nimble moves made it easy for him to thread the throngs of shoppers with their carts and oversized Ikea bags. What I didn’t know—couldn’t know—was that you took off after Colin, too, but on a different trajectory. Your hope was to intercept him if I didn’t. Smart move, Chris, smart move. I ran through the lower level, eyes darting left and right in case he found a resting place; eventually I came to the stairs leading up to the Ikea Cafe. A thought: Colin loves their french fries. Worth a shot, but no dice. Then I remembered he was drawn to a specific bedroom display, so I began a lap around the second floor looking for the setup. After ten gut-wrenching minutes, I finally made it to his favorite bedroom display. Again: no dice, no Colin. And now panic set in. You see, Colin’s autistic. He’s verbal, but his pragmatic language is weak; he struggles to explain things, particularly to strangers. When he’s scared, he has anxiety-fueled meltdowns which make it nearly impossible to engage him. He doesn’t know which strangers to trust or where to go if he’s lost and, as you saw, he’s prone to impulsivity. I imagined him running out the door and across the icy parking lot, confused and scared. I was about to ask for help when something magical happened: a voice from above, a savior with a PA system: “Michael McWatters, please come to the rug department.” One more time for good measure: “Michael McWatters, please come to the rug department.” Huzzah! I ran to the nearest directory: Rugs, downstairs. But how to get there? The map was inscrutable, or my mind wasn’t working very well. Or both. I could only picture Colin wailing, so anxious he’d begun to cough or throw up, as he’s done in the past when upset. So although I’m middle-aged, I once again summoned my mediocre-at-best high school football moves to avoid collisions while still making haste to Rugs. Glassware, Lamps, Kitchenware — RUGS! And there, to my relief, was Colin. He was lying atop a waist-high stack of rugs, smiling, rolling, getting his sensory on. And there you were, Chris. I recognized you instantly: the guy who saw me running after my son. So much to say, but first I had to check on Colin: 15 minutes apart, but he’s fine, natch. It’s me who’s a wreck: sweating through my heavy winter wear, panting and enervated from the adrenaline blast. Or do you? Maybe you know how many autistic kids go missing every year. Maybe you’re aware of the fact that nearly half will run away before they’re 17 (the technical term is “eloping”), often with tragic results. Maybe you just had a sense. Whatever the case, you did a remarkable thing. You saw an impish kid running away from his dad and understood there was something more at play. Most people wouldn’t have given the situation a second thought — and I don’t begrudge them, as outward appearances are deceptive — but you did, and you took action. You spared us both from excruciating anxiety…or worse. So, Ikea Chris, thank you. I didn’t get your last name, and I should have, because the letter I wrote to Ikea corporate is incomplete in that regard. In it, I described Sunday’s events, told them your first name, and asked that they recognize you for your compassion. If our paths cross again, I hope you’ll let me buy you a plate of Swedish meatballs in the Ikea Cafe. Colin will have the fries. TED Talk: "To understand autism, don't look away"
Today's TED Talk has an important, moving message. As this autism mom says, "There is no need to be an expert nor do anything heroic to include someone. We just need to be there...we simply need to be close. And if we are afraid of something or we don't understand something, we need to ask." It's seven minutes, and well worth it. Note: the talk is in Spanish with English subtitles. A young autistic boy sits quietly while children in the background gaze at him. Even though it’s inaccurate, I love this photo of Colin. First the accurate part: it captures my son enjoying a brief moment of quiet in a playground, unaware that some children were staring at him. Now the inaccurate part: the photo suggests exclusion and isolation. It implies that he might be the subject of teasing—or worse. It fits the narrative of autism we’ve come to accept as true. In this case, though, it simply isn’t. The real story is that Colin never stops moving; he’s a ball of perpetual, joyful energy, and moments like these are rare. Those kids? They actually tried to play with him a few moments before I took the photo, but he just kept on doing his thing. They seemed curious about this boy who didn’t need them; if anything, they were the ones who may have felt excluded. I took this photo to capture a peaceful moment, but when I looked at it later, what came through was something more melancholy. Why? Every photographer knows that context is everything. In any image, what’s excluded is as important as what’s included. Timing, angle, framing – each, in its own way, shapes our perception of a moment’s truth. No photograph tells the whole story, and most barely tell an accurate one. 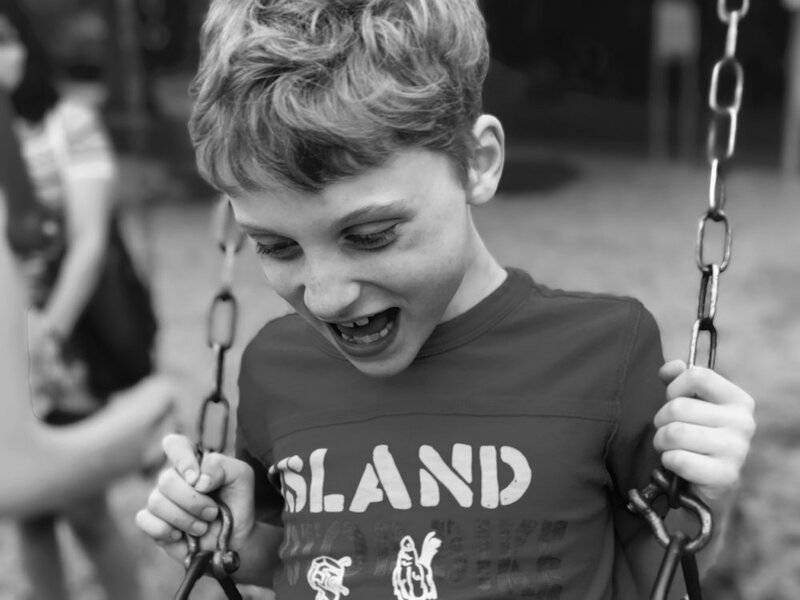 A young autistic boy laughs with joy while sitting on a swing in a playground. When I look at Colin, I see challenges. Big ones. But mostly I see joy and enthusiasm for the world—his world. I see a boy who loves life with a purity and exuberance I myself have never experienced, not even as a child. I have a choice, then: I can choose to frame his story so that it makes me sad, or so that it makes me happy. On my better days, I choose the latter.